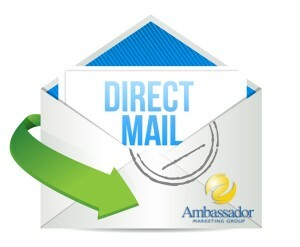 One of the specialties at Ambassador Marketing Group is direct mail projects and programs. Over 21 years, we’ve created thousands of direct mail projects from design and concept through delivery. Here’s a short list of critical factors to consider for a direct mail project. 1. Use a Solid List: The best way to increase your return on investment is to know your audience. At Ambassador Marketing Group, we have built a reputation for supplying the most accurate and targeted lists to generate positive response rates. We will walk you through the process to ensure your comfort and confidence. 2. Call to Action: A thoughtful, value-added promotion such as a sale, rebate or bonus will increase your response rate. It’s important to give your audience a reason to purchase now, so make your offer truly unique and big enough to provide great value to your customers within your budget. You should also include an offer code or scannable QR code to measure your campaign’s success. Let us help you with this. 3. Take Time to Design: A great design stands out in a crowd. A sharp look and interesting format also works to reinforce your message is essential to direct-mail marketing success. Let the professionals at Ambassador Marketing Group get creative. The brand establishment that a professional design lends to your direct-mail marketing materials is definitely worth the investment. 4. Write Effective Copy: Great copy identifies with the target audience and leads them to action. You must convey the feature and benefits you are offering. If you’re having trouble writing your own copy, our professionals will help you make your direct mail project a success. 5. Follow Up: Following up with your prospects can yield huge dividends. The more personal you can make it, the better. At Ambassador Marketing Group, we can suggest a plan for follow-up with your prospects. This may include following up a postcard with a brochure or sales letter personalized to the recipient. Perhaps a personal phone call is appropriate. This effort can also help you build a quality database of contacts and their information.